As Valentine’s Day nears, we all start seeing more hearts, red+pink and love wafting through the air. 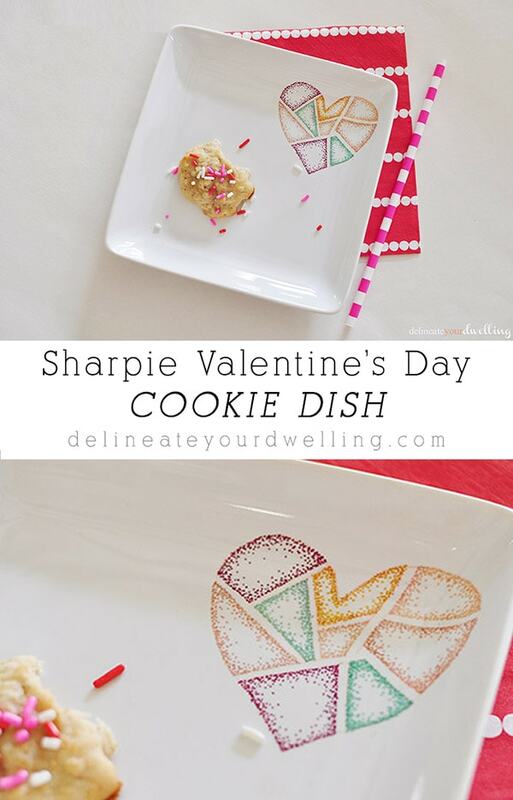 So, I decided why not create a simple Valentine’s Day Cookie Dish with the sharpie technique that is all the craze, to keep with the love themed holiday. .I used a number of pink shades, a red and a mint green fine tipped Sharpie. .I bought a white square dish at Target in their clearance section. This dish was $1.99. After quite a few random sketches, I decided on a patchwork looking heart. Using the lightest pink marker, I drew my boundary lines for each of the colors. Once, I had finished stippling all the colors, I was able to “erase” the light pink color using a q.tip and rubbing alcohol. As I had done previously on my Sharpie Mugs, put your dish in the oven before turning it on. Then, set your oven to 450’F. Once the oven reaches that temperature, set the timer for thirty minutes to bake. 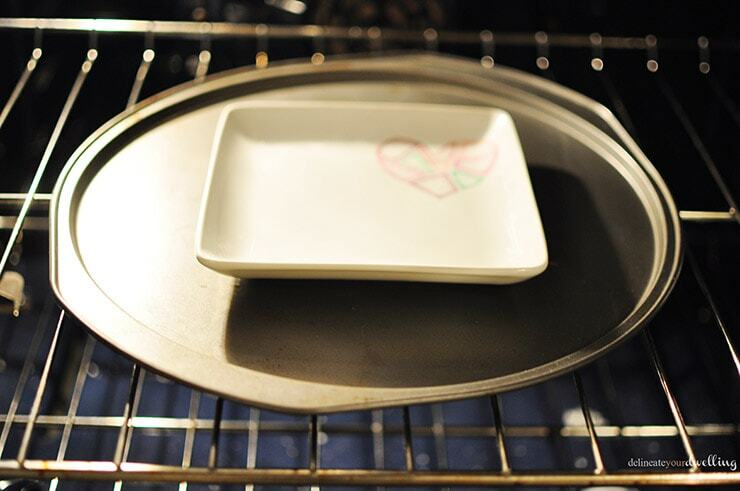 Once the timer goes off, turn off oven and leave the dish in as the temperature cools down. This will have prevent sudden temperature changes that can result in cracking. As noted in my disclaimer above, all the vibrant and colorful pinks I used on this project turned odd shades of mustard yellow. My fun mint color turned teal and the red turned maroon. So, if you are by chance looking for a fall themed Valentine’s Day Cookie Dish, these are the colors for you! Regardless of the unfortunate color changes, I really love how this dish came out. Plus, with a few sprinkles and a delicious cookie… any dish looks better! Great artwork! It’s a good design and color combination. I just wanted to let you know that you are my nominee for the MEGA Rockstar from Creativity Unleashed Week 51! 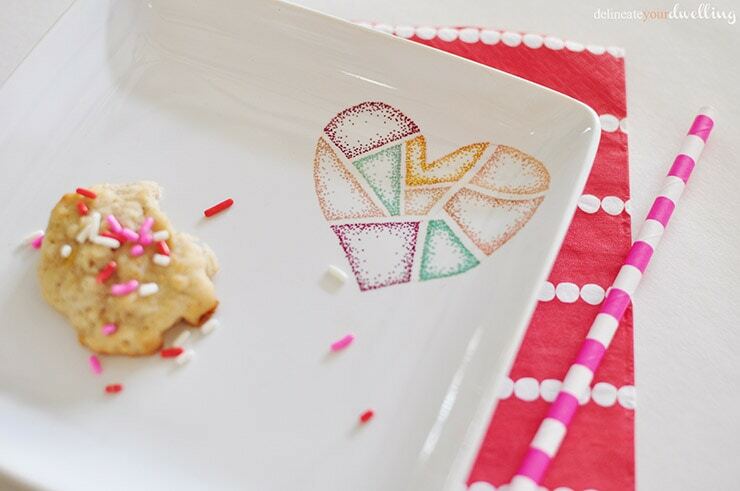 I adore your Geometric Valentine’s Day Cookie Dish! It’s almost like art! Aw, thanks for the nominee! I’ll be sure to share and vote! So awesome!!! I love it! Tweeting it out! Thanks for linking up at Monday Funday. Girl! I love everything you do, and this is no exception! So cute. Oh my goodness, you’ve made my day! Thanks for stopping by!! Ha, you are funny Carissa! Thanks for hosting a great link party. Very cute!! 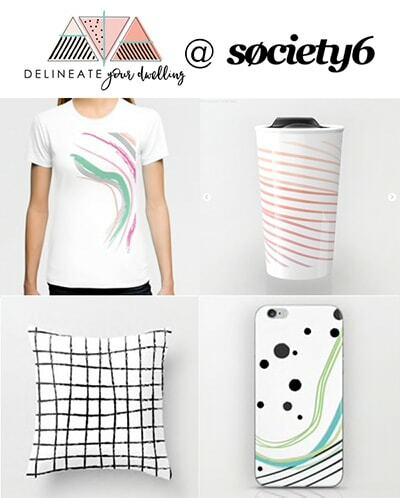 Love the design you chose! I would never have thought of that patchwork – beautiful! My Sharpie mugs changed a little when I baked them, too. I love the fine tip Sharpies and the dot pattern you did. So I have some square white plates that I just today put into a Goodwill pile…fate? Must be. Thanks for the inspiration! This is so cute, I love the patchwork heart! I appreciate you being honest about the colors changing after the baking process. I love sharpie projects so it’s good to see what will happen before trying it myself. I think the colors turned out great! Thank you for the feature, Hani! AMAZING! Truly! I love this idea. SO CUTE!! Totally looks like something that I would totally buy at Target. I will definitely have to try this technique! Awesome project! Aw, what a complement! Love me some Target! Thanks for stopping in Megan. Super super cute and I love how easy it is. I already have so many patterns and ideas brewing for this! Love, thanks! OH this is SO cute!!! Love the design. I really like how this turned out, the colors are darker but still so cute. Thanks for the tips! Woah! So cute and SO easy! Love it! I’m all about the cute AND easy projects! I love it! Even with the color change, it turned out great!! Now this is the cutest thing EVER! 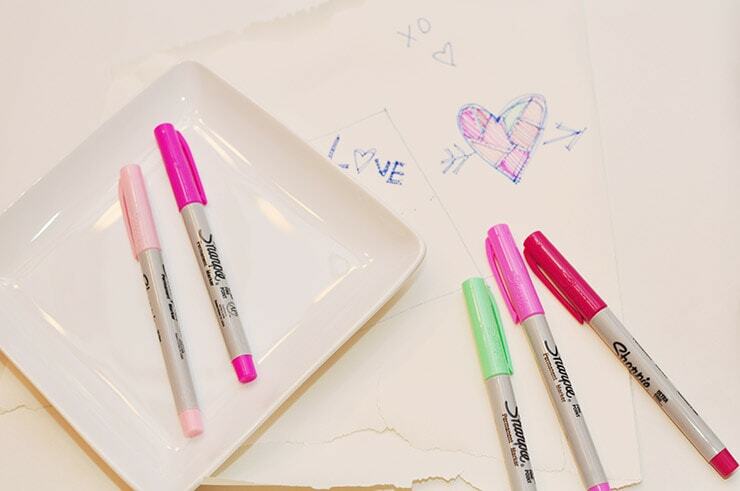 I love a good Sharpie project! Pinned! Chrissy, I’ve not tried washing this particular cookie dish, but I did the exact same method, with high oven temps and the same cook time on some mugs and they were dishwasher safe. The only difference with these two projects was I used black sharpies on the mugs as opposed to colored sharpies on this dish. So pretty Amy! Pinned, of course! I love the colors before and after!! What a cute little patchwork heart. Thanks for sharing, I can’t wait to try this!! This plate is so cute! LOVE how easy it is to make it! Amy! I love this! First I love the design. You and I both have a thing for these string art inspired shapes don’t we? And the colors! Ahhhh. Love it! Thanks for linking up at The Makers. 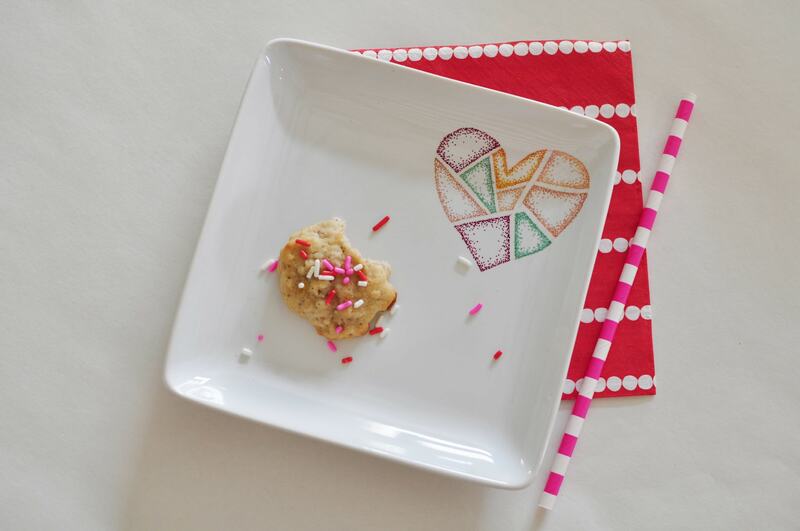 Wow, I just LOVE the heart and the colors that you used on your plate! It looks great! Really pretty!!! Love your technique and beautiful photography!!! Pinning and sharing. 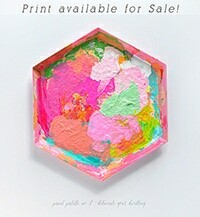 This is the most adorable thing I’ve seen :o) Totally pinned to my crafts board! Very cute! 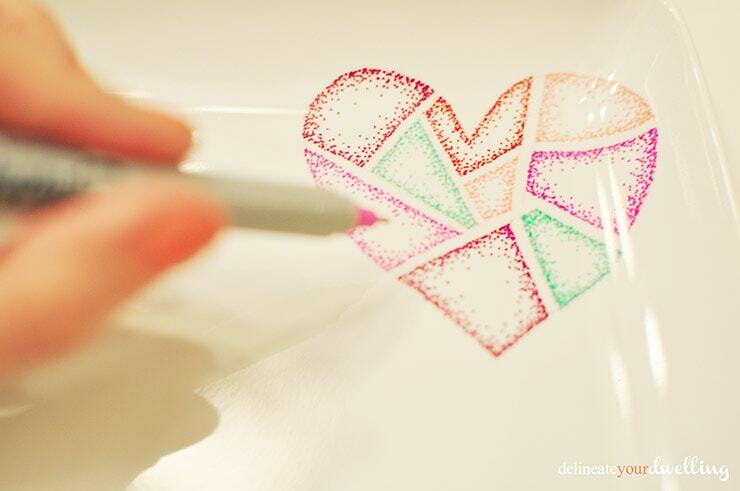 Love how you stippled the shapes in the heart. Aw, thats so sweet of you Alexis. It felt like a bit of a fail, but turned out okay. This is adorable Amy! I wish I was as coordinated with drawing/dotting as you were, what a great way to customize a dish! Thanks so much, Allison! Felt like a bit of a fail with the autumn color palette it turned out to be.